Sino-UK Link is a Non-Government Organisation established in 1999 to promote the exchange of economy and culture between the people of China and Britain. It organised a study tour (sponsored by the Chinese government) on wastewater management for 25 engineers from Jiangsu Province (capital and largest city Nanjing) and municipalities within it in June 2012. The delegation leader was Ms. He Lingjun Deputy Divisional Director, Urban Construction Division of the Department of Housing and Urban-Rural Development of Jiangsu Province. 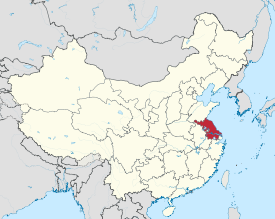 Jiangsu is the most populous province (79 million people, 102,600 km2, England 52 million, 130,395 km2). Since the initiation of economic reforms in 1990, Jiangsu has been a hotspot for economic development. It has the highest GDP per capita of all Chinese provinces. It is home to many of the world’s leading exporters of electronic equipment, chemicals and textiles. Trade effluent control is underdeveloped but when the government wills it, it will happen, which it probably will because the Pollitt Bureau has said “we shall take care of the water environment”. Sino-UK Link asked FWR and hence Dr Tim Evans, Technical Secretary of FWR’s Wastewater Research & Industry Support Forum to review wastewater management especially in the UK in an all-day seminar that was brilliantly translated by Tom from Sino-UK Link. We started off with the evolution of river basin management, privatisation, environmental regulation, performance regulation and the 5-year business planning cycle because without understanding this it is sometimes difficult to understand why companies act as they do. China decided recently to implement RBM. We then cantered through the principal legislation. Sewers are the start of wastewater management, and the start of treatment mediated by the fixed-film biomass on the sewer walls. The ability to control flow, load and hazardous substances from non-domestic properties is crucial for the rest of wastewater management – there was a bit of discussion about this. We discussed the evolution of sewers, CSOs, interceptor tunnels, green infrastructure for stormwater (with its multiple benefits monetised) and FOG. Then wastewater treatment itself; Beckton (3.3 million p.e.) proved to be an engaging case study because of its transition from mesophilic anaerobic digestion (MAD) and ocean disposal to raw cake incineration and now back to MAD but preceded by thermal hydrolysis (TH) to increase the total yield of renewable energy and achieve much better dewatering which will enable autothermic combustion. Delegates wanted to explore thermal hydrolysis further because the following day they visited the Cambi site at Chertsey, where TH has boosted MAD capacity from 105k p.e. to 270k p.e. ; most of the additional input being waste activated sludge from extended aeration. Sludge treatment and the background to the rules for land application in the EU and the USA would not have been complete without covering the reductions in chemical contaminants and discussing the risks from pathogens, including airborne and odour. Phosphate recovery from dewatering liquor and the global depletion of phosphate resonated with delegates because China’s government has sought to restrict exports of this resource. Ammonia recovery from dewatering liquor can also be financially competitive with biological treatments. Finally we covered water reclamation and reuse, including chemicals in recovered water. Delegates found it hard to believe that they were in a water scarce area (i.e. <1000 m3 freshwater per person.year) because it had rained so frequently during their visit. In March 2012, following 3 dry winters, there were fears that resources would be very severely restricted in London by September – and then it started to rain! However, never waste a crisis; it should have been a wakeup call to plan for the next drought. Examples from Australia showed that people accept recovered water when it is properly treated and managed, the language is appropriate and there’s nothing else. Everybody seemed to have enjoyed the day and to be very enthusiastic. In future there should be more hits on www.fwr.org from China to tap its rich resource of information.